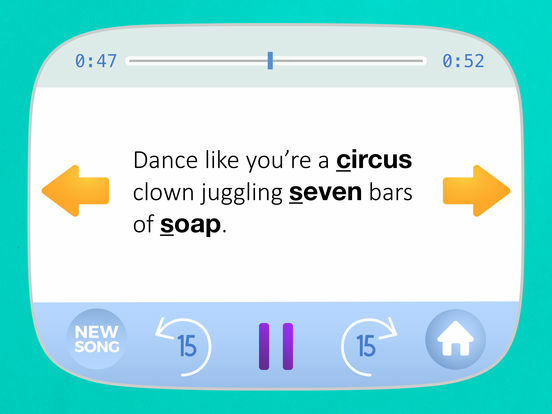 Dance Party Articulation is a unique musical speech therapy material that can instantly turn any therapy session into a full-fledged dance party. It is a comprehensive collection of over 500 wacky and hilarious dance instructions designed for speech-language pathologists to use with individuals who exhibit difficulty producing the following speech sounds: S, Z, R, L, S/R/L Blends, SH, CH, and TH. It is intended to aid in the remediation of articulation impairments, as well as auditory and language difficulties because clients often need practice in more than one area of communication. 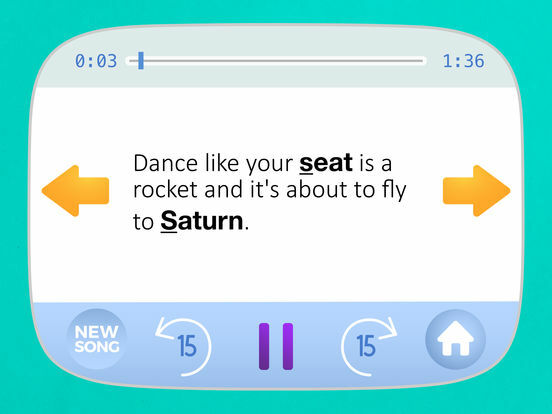 Tons of dance instructions: with just a tap of a finger, children and clinicians can read one of over 500 sound specific articulation dance instructions that are perfect for the speech therapy setting. Songs galore: after reviewing and talking about the given dance instruction, tap the Play button to hear one of five different songs that can perfectly kick off a spectacular dance part. Hilarious experiences: before, during, and after each dance party, oodles and oodles of laughter will fill the dance floor from all of the fun dancing that will be taking place. Child-friendly interface: simple and intuitive, a wonderful experience from start to finish. As a form of non-verbal communication, dancing allows people of all ages the opportunity to express thoughts, feelings, and ideas in a manner that explores and encourages rhythmic body movements. In my experience, when most children are exposed to music and are given the chance to dance, they do so with a massive smile. That is why I feel it is essential that we, as speech-language pathologists, make a conscious decision to infuse music and dancing into our teaching activities whenever possible. It just makes learning that much more fun! That is why I created Dance Party Articulation. The dance instructions format is a departure from traditional articulation drill work and is effective for students ages 6 and up. Because of this unique format, clients enjoy talking about the various dance moves with their friends and classmates outside of the speech therapy room, further practicing their communication skills and thereby facilitating the sometimes difficult stage of carrying over newly-acquired skills. By reviewing the dance instructions with the client, paraprofessionals in the classroom and/or parents at home can reinforce the client’s targeted articulation skills while sharing a fun activity. Practicing these skills in environments outside the speech therapy setting increases opportunities for generalization. Regardless of when, where or how these dance instructions are used within the speech therapy session, one thing is certain, children (as well as clinicians) will have a blast taking chances and attempting to come up with new dance moves . . . and in the process, they will continue to practice the correct pronunciation of their sounds at the sentence level. So what are you waiting for? Let your imagination run wild and have fun with this musical therapy material!